WHO: Amaranth Borsuk, assistant professor, School of Interdisciplinary Arts & Sciences, University of Washington Bothell. 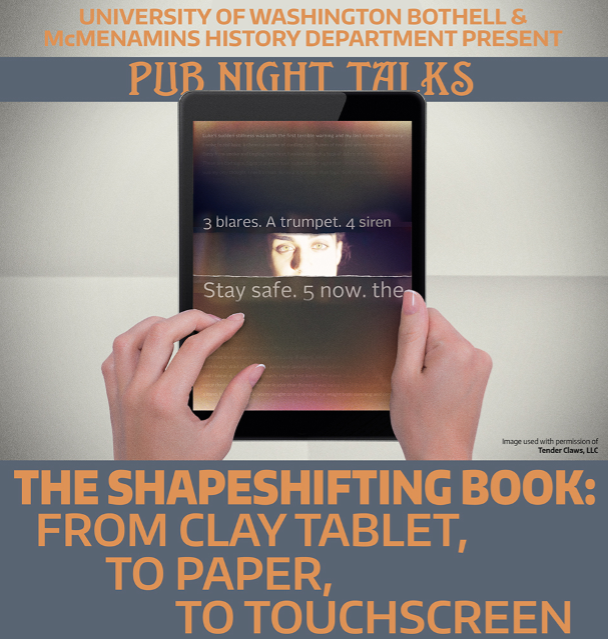 WHAT: “The Shapeshifting Book: From Clay Tablet, to Paper, to Touch Screen,” a Pub Night Talk cosponsored by the University of Washington Bothell and McMenamins. WHEN: 7-8:30 p.m. Tuesday, Nov. 27, 2018. Doors open at 6 p.m.
WHY: The book has taken many shapes over the thousands of years people have recorded information. Borsuk explains how it has always been a dynamic, interactive experience and imagines what the book might become. HOW: Free and open to the public. All ages welcome. Seating: first come, first served. Talk followed by Q&A.